First of all, most people wouldn't know what the **** they were eating if you put it in their mouths blind... this is a tough skill for seasoned chefs with a superior palate than most. Second of all, you didn't do a "blind taste test" unless you gave them ribeye at the same time. That said, chuck eye is a good, cheap cut. I've never disagreed with that. Merlot gets a bad rep, a lot because of that damn Sideways movies. It's a good wine, nothing wrong with it. And since it's fallen out of favor, you can get some DAMN FINE merlots for a good price. You are right.. And if the movie help keep the price of the product down, it's the ONE thing it did that wasn't useless.. I actually enjoy the film, but it did damage the merlot brand, IYAM. Hey, I admitted I've lost bar fights, I just never want to have to admit I've lost a breakfast-bar fight! Nope, that'd be bad! I split a $120 wagyu ribeye last night with a buddy. OMG. It was amazeballs. I'd lick it dry in the pink parts.. Of course that's not saying much really... Rep! The strip is good, but it's dry. 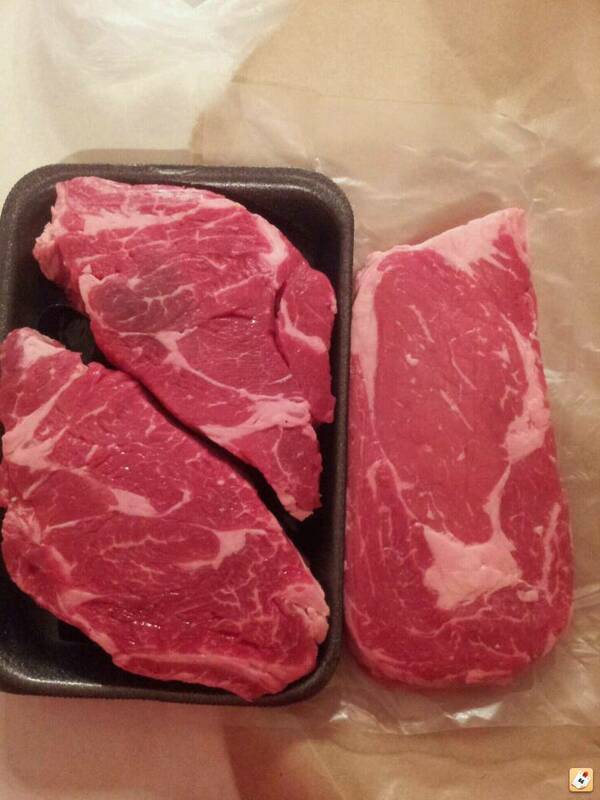 Two $5.99 a pound chuck eyes next to a $13.97 a pound rib eye. Yeah. Two nights in a row!!! Last edited by GloryDayz; 10-06-2013 at 07:36 PM.. In the end I was the only one who knew which was which (they never even saw the before pics), but even I had to admit that the chuck eye was not only equal, but had a better flavor and texture. Better cow perhaps?? Either way, at a $7.99 per pound difference even a tie in flavor and texture would have meant that the chuck eye won. We've (the accountant and I!!) decided that neighborhood grill-outs over the fire pit - I've made my own fire pit modification!!! - just got much more affordable. LOL, like that matters! Filet is the way to go all the time every time. Grilled some Friday night you could cut with a fork. Not sure what you mean there. Yea you can cut hamburger with a fork but a good filet is the best meat hands down. Its not close and its also the reason it cost the most on average.